Note: This post originally appeared on Apsalar. Mobile marketers are coming around to the idea that personalized push notification messages can be up to 800 percent more effective than generic blast campaigns. Mobile marketing solutions let you automate your marketing while generating more personalized content. Furthermore, in addition to personalizing the content of a message, mobile professionals are experimenting with personalizing when the messages are sent. It’s no secret that time zone plays an important factor in when messages are opened. It’s important to make sure that a message intended for mid-morning in San Francisco isn’t waking up your Australian users at 4am. But as it turns out, scheduling a message by time zone isn’t enough. Marketers need to evolve beyond blasts and improve open rates by scheduling push notifications using Optimal Time. In our last data science report, “Personalize or Bust: The Impact on App Engagement,” we found that using Optimal Time resulted in open rates 3x that of notifications send scheduled by time zone. What is Scheduling by Time Zone? When notifications were still in their infancy, sending them manually or by a scheduled blast to all your users was a standard practice. As the practice has evolved, recognizing user time zones and regional differences was the natural next step. Scheduling by time zone can help ensure that your messages are not sent to your users when they’re asleep. 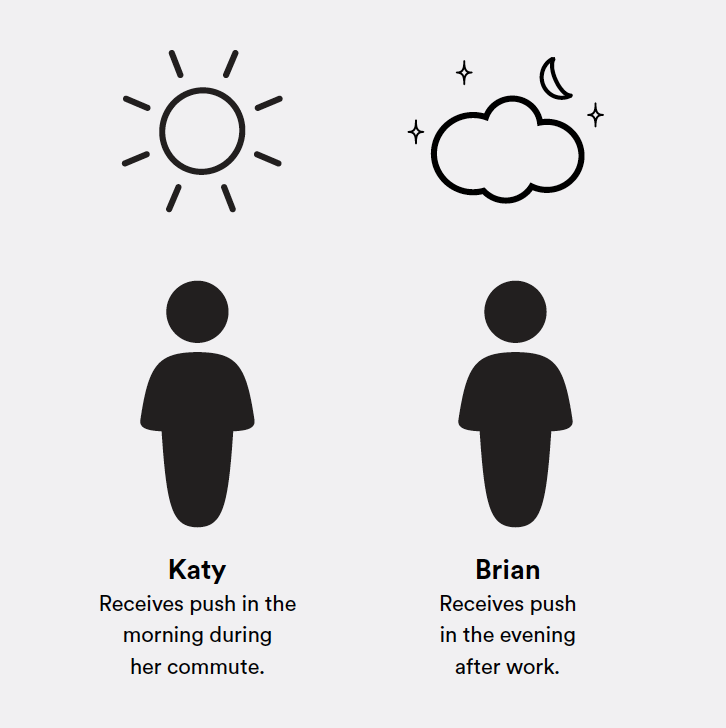 Using time zones as a benchmark allows you to send messages to users at a specific time (i.e. 11am on a Wednesday morning) and make sure it’s received at the same time around the world. Why Isn’t Scheduling by Time Zone Enough? Although scheduling by time zone means you can respect typical sleep patterns, you’re not able to recognize individual user patterns of activity in the app. For example, if you schedule a notification by time zone, a marketer might pick a user-friendly time like 3pm. But one loyal user might be a night owl who frequently returns to the app at 11pm. Then a notification at 3pm would miss the mark and this particular user wouldn’t benefit from your scheduled campaign. Besides individual user preference, region and culture also have a distinct effect on when users engage with push notifications. For example, in our report, “Breaking Barriers to Push Notification Engagement,” we found that, in APAC, users most frequently engage in the morning, whereas in LATAM, users are more likely to engage in the evening. Culture and region are just another reason the scheduling by time zone isn’t enough. To send notifications based on individual user behavior, you need a tool like Optimal Time. Optimal Time is a machine learning algorithm that looks at each user’s individual app engagement patterns and automatically sends messages when users are most likely to open. Instead of sending to all your users (or even groups of users) at the same time, Optimal Time will send notifications to users at personalized times, using their unique app history. Why is Optimal Time Effective? Optimal Time results in 3x higher open rates than messages scheduled by time zone because it creates a tailor-made experience for each individual user. As we found in our report, although Optimal Time open rates are 3x higher than notifications sent by timezone, 3.5x more notifications are sent scheduled by time zone rather than using Optimal Time. This means that there’s a great opportunity for future engagement and adoption of more personalized push notification practices. One Leanplum customer A/B tested a push notification promoting in-game currency. It tested Optimal Time push against a control group, and was able to bring more people back to the app, increasing revenue by 17 percent. For example, say you want to send all your users a notification that Virgin America is hosting a flight sale. Optimal Time takes into account each user’s past behavior. It may send Katy a message in the morning while she’s commuting on the bus, but Brian a message in the evening, when he’s relaxing after work. By understanding how users interact with your app, you lure more people back to your content when they’re ready to engage, increasing revenue. 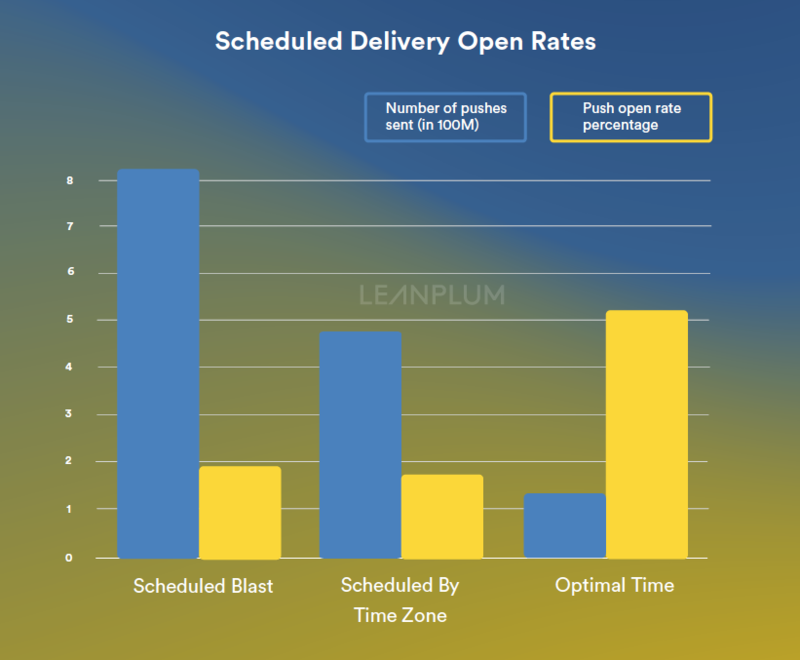 If you want to try Optimal Time for yourself and boost push notification engagement, request your free demo from Leanplum today. We’re happy to answer any questions you have about how you can use Optimal Time or how Leanplum can increase your mobile ROI.